The far-right movement Patriotic Europeans Against the Islamization of the West, also known as PEGIDA, held its first march in Catalonia, Spain, on Wednesday. The protest was organized by the Spanish branch of the German far-right movement established in 2014. PEGIDA Spain selected Catalonia, the region which is home to about 450,000 of the 1.8 million Muslims living in Spain, to host its march. Many security forces were deployed in the L'Hospitalet region in Catalonia, where the protest was held with the permit of the Catalonia autonomous region's interior ministry. 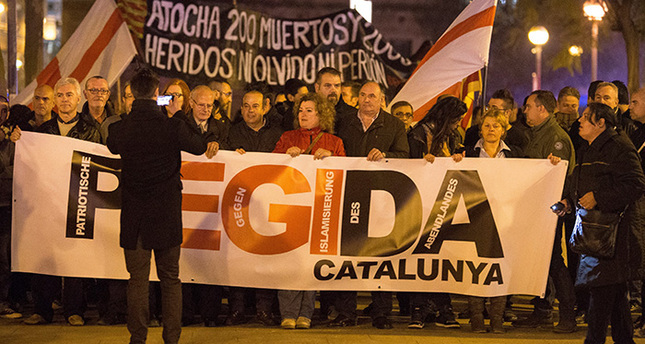 About 100 PEGIDA supporters marched for one hour on the 11th anniversary of March 11, 2004 terror attacks that targeted four trains in Spain and left 192 dead. The Mayor of L'Hospitalet region Nuria Marin said in a Facebook post that she was against the PEGIDA march, saying L'Hospitalet is a welcoming and pluralistic region. Anti-racism organizations called SOS Racismo and UCFIR staged an anti-racism and anti-PEGIDA march one hour before the PEGIDA march. In a statement, the organizations said that PEGIDA does not defend the secularism of the state, but is a racist and Nazi movement. PEGIDA organized protests in Norway, Denmark and Sweden and Britain in January and February 2015, with low turnouts. Hundreds of people also took part in counter-demonstrations against the protests.